Grounded in a teaching philosophy that banishes lectures and encourages hands-on exploration, the course represents a collection of best practices gleaned from decades of teaching experience and studious visits to college physics classrooms nationwide. Considered the “applied” sibling to the “analytic, numerical, and experimental” Physical Sciences 12 sequence, AP 50 is being offered for the second time this year at the Harvard School of Engineering and Applied Sciences, open to undergraduates from all concentrations. “For today's knowledge-based economy, it’s not so much what you know, but what you do with what you know,” says Koleci. Team-based design projects feature prominently. 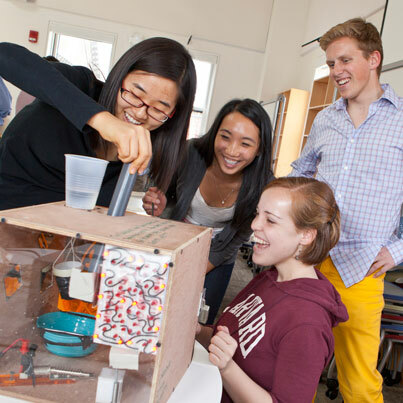 Over the course of the 2012–13 year, students reverse-engineered musical instruments, using the new knowledge to design “perfect” panpipes, zithers, and diddley bows. They used electronic circuits, laser cutters and band saws to build secure safes and then crack the codes. They also built Rube Goldberg machines, contraptions that achieve a task—in this case, cracking an egg—through a chain reaction of motions. By several measures, the new approach is paying off. The attendance rate was 97% last year (compare that to the number of seats filled in an average lecture hall). Students rated the instructors 4.2 out of 5 on their year-end evaluations. And in fall 2012, AP 50 showed the largest gain on the force concept inventory, a measurement of students’ understanding of basic concepts, of any Harvard physics course taught in the last six years. “For the fall 2013 semester, we’ve had to increase the cap on enrollment from 50 to 90,” notes Koleci. To foster those skills, Mazur and Koleci issue open-ended challenges that force the students to brainstorm together, instead of working silently and independently on paper. “It was definitely hard trying to get the initial spark going,” says Alden, who took AP 50 last year, “but once a couple of ideas started flying around, someone else in the group might latch onto that idea and change it a little bit, so basically no idea was stupid. Emily Lowe ’14, who studies Earth and planetary sciences and anthropology, was proud of her team’s accomplishment when, after many attempts, they cut a string that released a catapult that launched a rubber ball precisely into a funnel. At last, elastic collisions and projectile motion made sense. AP 50 is not just about playing with mouse traps and bouncy balls, of course, but even the paper-based assignments are unconventional. In one class meeting, Mazur and Koleci started asking questions on topics that hadn’t been covered: What’s the difference in electrical potential that leads to a lightning strike? Suppose, instead of leaving a 100-watt light bulb on for an hour, you used that energy to lift a 130-pound person. How high would he or she go? During the class period, the students work in teams to generate a realistic estimate. On homework assignments, students are graded according to how well they approach each problem, and how thoughtfully they reflect on any errors afterward. There is also no printed textbook: instead, a free, collaborative, online text lets students annotate their reading on laptops and tablets and engage in online discussions after class. And there are no exams—at least, none like any you’ve seen before. The students answer a few questions individually, using Mazur’s Learning Catalytics system, and then compare their answers within a group, reasoning their way through any disagreements until everyone at the table settles on a single answer.